Starring Taron Egerton, Colin Firth, Julianne Moore, Mark Strong, Halle Berry, Channing Tatum, Jeff Bridges, Pedro Pascal, Elton John, Sophie Cookson, Edward Holcroft, Vinnie Jones, Hanna Alström, Poppy Delevingne, Michael Gambon, Bruce Greenwood, Emily Watson and Mark Arnold. Screenplay by Jane Goldman and Matthew Vaughn. Distributed by 20th Century Fox. 141 minutes. 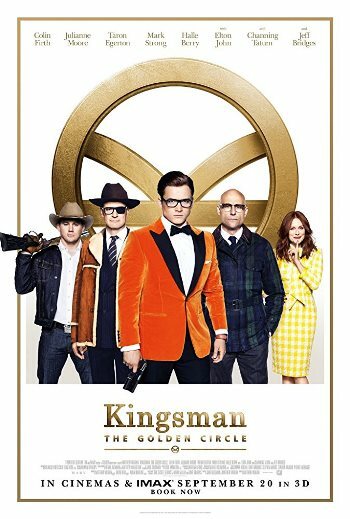 Rated R.
There is nothing significantly new here folks, but if you enjoyed the first Kingsman, you will likely enjoy this second installment. The movie starts with a super slick “fight in a moving car” scene with Eggsy (played by Taron Egerton) and Charlie (played by Edward Holcroft) – a former Kingsman trainee turned bad with a super smart robotic arm. The attention-grabbing opener ends at the underwater “swan rendezvous,” where Eggsy takes a swim through sewage to be on time to meet up with his love, Princess Tilde (played by Hanna Alström,) for his buddy Brandon’s birthday celebration. It looks like everything has fallen into place for Eggsy since saving the world in the first Kingsman movie. Unfortunately, while at dinner trying to make a good impression with Tilde’s parents, the King and Queen of Sweden, all hell breaks loose. Every Kingsman agent is called home and headquarters are blown up using the coordinates stolen by the “remote controlled robo-arm” at the end of the opening car scene. Are you keeping up? Good. It only gets crazier from here. Eggsy and Merlin (played by Mark Strong) are the only two remaining people unharmed from the Kingsman family. Merlin encourages Eggsy to stay brave – no tears will be shed until they have been able to implement the doomsday protocol and avenge their lost Kingsman. This protocol takes our remaining two Kingsman to Kentucky, USA: the home of Statesman, the US-southern drawl-lasso throwing-whiskey drinking version of the Kingsman, including the ultra-cute spy names: Ginger Ale (Halle Berry), Whiskey (Pedro Pascal), Tequila (Channing Tatum), and the leader, Champ (short for Champagne — played by Jeff Bridges). Okay, so for the sake of a concise story summary, I consolidated and skipped around a bit. Before Kingsman is blown up, we are introduced to the ruthless villain in this movie: the drug lord, Poppy (played by Julianne Moore). Poppy has built a reclusive 1950’s-themed empire in a Cambodian jungle, where she is forced to hide without proper recognition of her accomplishments as a businesswoman. Every non-robotic trusted person working for Poppy has been given a 24K circular mark to some area of their body-thus “The Golden Circle.” If you are squeamish about cannibalism, the opening scene with Poppy would be a good one to cover your eyes, or even step out for the snack bar. It’s gross in an “only the Kingsman franchise can get away with this” way. To get the recognition she feels she deserves, Poppy has tainted her latest worldwide drug shipment with a virus that causes a blue “rash.” Not only is this the first sign of the viral infection, but it also outwardly identifies anyone who has used one of Poppy’s recreational drug products. Begin interesting commentary on drug use in 2017… MILLIONS of people are affected, from all socioeconomic backgrounds and all walks of life. Poppy holds the antidote for ransom and the President of the United States decides that he is going to pretend to negotiate, but doesn’t plan to follow through, as the last stage of the viral infection is death, and, well, he sees this as an end to his war on drugs. When the Kingsman and Statesman realize that the affected population includes their loved ones, they realize they will need to work together to stop this virus. That is the short summary. It was great seeing the old characters back together on the big screen, even for the short time they were involved before being decimated by Poppy’s evil scheme. Like Samuel L. Jackson’s villain from the first film, Poppy is played way over the top, but she stays true to her maniacal character throughout. I don’t want to spoil this moment, but really, truly, Elton John is a joy to watch in his absolutely insane cameo performance. You don’t go to a Kingsman movie looking for an Oscar-worthy performance, you go for quick-paced action, over-the-top violent characters, and a little sarcastic social commentary. At 2 hours and 21 minutes, the movie felt like it sped by. I know so many people that want to see this in the theater and I will happily be joining for at least a second time. I hope they go for a third movie so we can get more Channing Tatum screen time and further development of Halle Berry’s character, Ginger Ale – she and Merlin deserve an extra-nerdy spin off with super tech gadgets. Copyright ©2017 PopEntertainment.com. All rights reserved. Posted: September 22, 2017. Tags: Bonnie Paul, Bruce Greenwood, channing tatum, colin firth, Edward Holcroft, elton john, Emily Watson, Halle Berry, Hanna Alström, jeff bridges, Julianne Moore, Kingsman, Kingsman: The Golden Circle, Kingsman: The Secret Service, Mark Arnold, Mark Strong, Michael Gambon, movie review, Pedro Pascal, PopEntertainment.com, Poppy Delevingne, Sophie Cookson, Taron Egerton, The Golden Circle, Vinnie Jones. Bookmark the permalink. Previous post ← Have You Heard About The Shadowboxers?